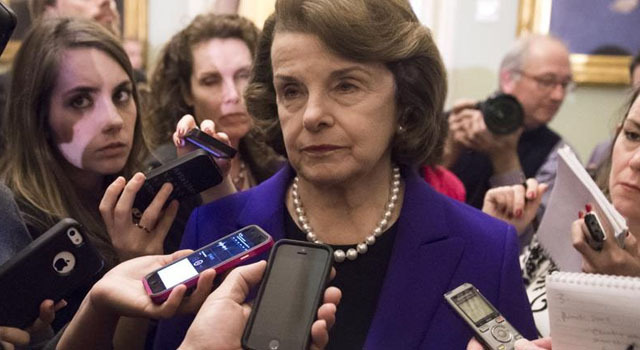 (JTA) – State Democratic leaders in California officially endorsed longtime Sen. Dianne Feinstein’s progressive opponent – and the vote backing Kevin de Leon wasn’t close. Feinstein, a moderate Jewish lawmaker who has been a senator since 1992, beat de Leon in the Democratic primary by 33 percentage points last month. But the 51-year-old assemblyman finished second and advanced to a runoff with Feinstein, 85, in the general election in November. On Saturday night, 65 percent of the state Democratic Party’s 333 executive board members opted to endorse de Leon in the general election and only 7 percent chose Feinstein. Another 28 percent voted for “no endorsement,” according to the Los Angeles Times. In February, before the primary, the board had voted 54 percent to endorse de Leon to 37 percent for Feinstein. Neither won the endorsement, however, because they fell short of the 60 percent requirement. Feinstein has a comfortable lead heading into November, but the vote indicates that California Democrats are abandoning her platforms and shifting to the left. On Sunday, California Democrats adopted a resolution at their annual convention to oppose federal bills intended to thwart the movement to boycott Israel. Feinstein and Barbara Boxer were the first Jewish female U.S. senators, having been elected the same year.